Casoncello: a Fascinating "Small Garden of Delights"
The Casoncello Garden: an Unexpected Feast for the Senses. The Gardens of Casoncello were conceived thanks to the work, dedication and passion of Maria Gabriella Buccioli, who in 1980 created them by starting a gradual reclamation of her family’s hectare of land. 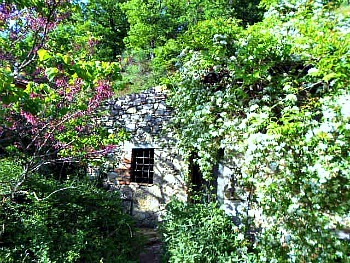 The property had been abandoned for over 30 years after damage suffered during the last war and, at first, only the hay barn together with the farmhouse – where Maria Gabriella now lives – were restored (in the picture above, near the entrance to the house is an interesting arrangement with Cercis siliquastrum – lilac flowered; to the left – and the creeping, white-flowered Rosa banksiae, to the right, which is better described further on). From the disinterred flooring and foundations of the original house – reduced to rubble during WW2 and recovered by means of an archaeological dig – now an evocative garden flourishes. 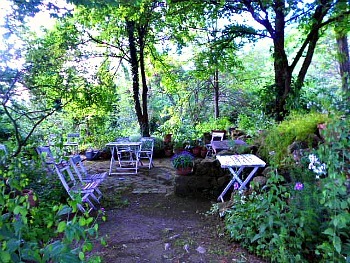 Laboriously, bramble by bramble, the land was cleared of its web of undergrowth, and made accessible again (in the picture below, at the top of the garden, tables have been placed in the area occupied by the former house – the one that was destroyed during WW2: this is the so-called "giardino della casa che non c'è"; that is, literally, 'the garden of the house which is not there'). 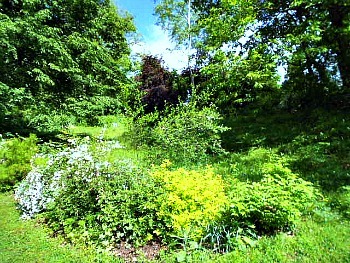 Gradually, from this bleak picture there emerged what was to become the framework of the garden to be, and many of the area’s wildflowers were reintroduced – or reappeared of their own accord. Rare and endangered plants started to join the show and prosper, alongside a myriad of other ornamental species, with a special emphasis on the hardier varieties that best adapt to this environment. Little by little, a radiant “blossoming jungle” took form, made up of a huge variety of antique roses, flowering shrubs, grasses, aromatic and medicinal herbs – as well as many local wild species, which find here a sanctuary that protects them from the risk of extinction. The beauty of the gardens, deceptively simple and seemingly spontaneous – in a word, its ‘wild’ look – is actually the result of these choices. 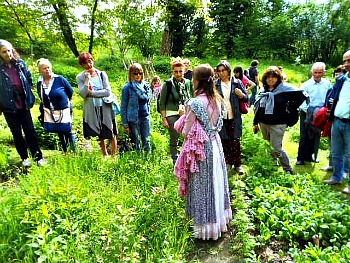 The Gardens of Casoncello are unique also in their dedication to conservation and the expansion of biodiversity, for the respect they show to wildlife and to native plants, and for the application of strictly ecological gardening techniques (in the picture below, Gabriella is giving a tour, and she is very keen on passing on the message of the garden as well as highlighting its having been "brought by the wind" – or, as she says in Italian, 'il giardino portato dal vento'). Opened to the public in 1996, today the Casoncello is a multicoloured patchwork of small gardens, which unfolds to reveal a selection of painting frames – like living botanical “tableaux vivants”: meadow, vegetable garden, rock garden, small pond, woodland garden, herb garden, borders of flowering shrubs and of herbaceous perennials, small orchards and mixed hedgerows all mix and mingle to create a succession of ‘rooms’ – as in a painting. This garden takes its inspiration from the English tradition and owes a lot to it, but then adapts to its more peculiar setting: a mountainous (and therefore mainly continental) climate, with Mediterranean influences. 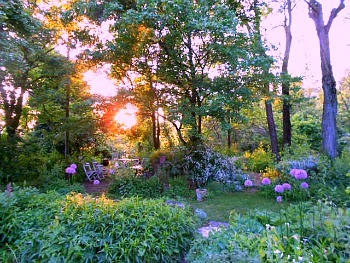 A tour of the garden is a treat for all five senses alike (sight as well as hearing, touch in addition to smell – and even taste), and offers pleasant moments of peacefulness thanks to its harmonious beauty. A gallery of pictures follows, showing some of the 'rooms' – or living paintings – of which the garden is composed, and that were mentioned above; some of the principles behind the garden will also be explained at greater length with the individual pictures. 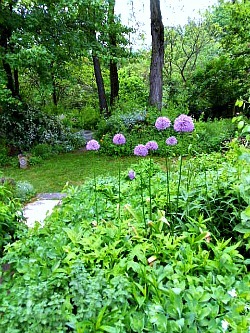 The first image below shows the area of the garden entrance; all pictures were taken in late spring – at a time when the garden is at its best; in early May, for instance, the visitors are greeted by the beautiful lilac blossoms of Allium spherocephalum. 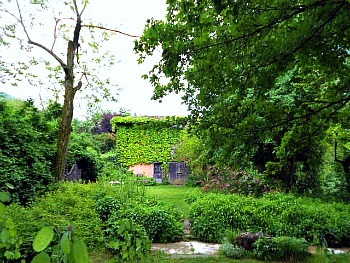 Below is another image of the area at the garden entrance, seen on the other side, with the old hay barn covered by an ivy climber, and where the guided tours usually begin. 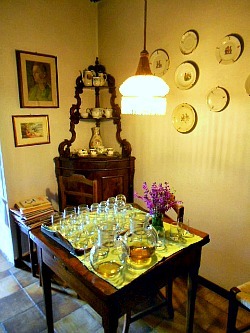 As anticipated above, the Casoncello can only be visited on a guided tour, passing several areas of flowering shrubs as one descends towards the lower part of the garden, called "bosco giardino" ('wooded garden', below). The mixture of flowering shrubs and herbaceous perennials of different outlook, colour and hardiness composes a real succession of 'picture frames' – made with plants rather paint, but the principle behind it is the same. 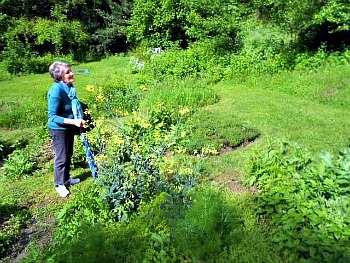 Reaching the bottom part of the garden, there is a flat area where the allotment-garden is hosted (below). Even if at first sight this may simply look like a vegetable plot, the idea is quite different, as vegetables are mixed with flowering plants, often mutually combined in order to keep away pests in a natural way. But even here the intent is also aesthetic, as the plots aim to appear beautiful to the eye as well as useful and – again – transmit a message. The boundaries of the Casoncello and of the allotment-garden are sheltered by an impressive bamboo grove, raised in authentic Japanese style (below). 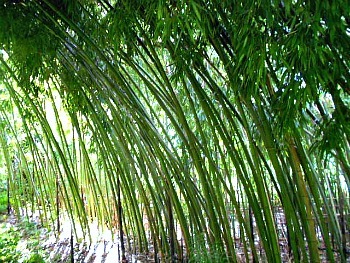 Bamboo is in fact a giant herb and it can be quite exuberant, so it has to be kept under control – while at the same time allowing it to grow naturally. This is achieved with the help of a Japanese volunteer garderner. 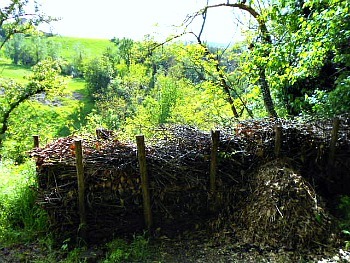 The ecological message of the garden is very important, and Gabriella aims to pass it on through different examples, all related to a gentle but firm horticultural management which leaves plenty of room for the natural development of plants as well as to the reintroduction of old techniques; for instance, below is shown a 'dead hedge' – a traditional way of delimiting a property or a garden which had been almost totally forgotten but has been reintroduced here, and which is very useful in order to transmit the importance of dead wood for many small organisms that depend on it for shelter, food and reproduction – as well as being, in its own way, beautiful. 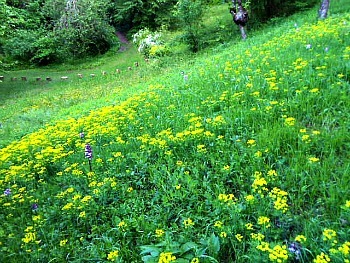 Below, the meadow is a tapestry of colours throughout the different seasons; around mid-May, for instance, it is animated by a pleasant combination of yellow spurge (Euphorbia sp.) and wild orchids, such as Orchis purpurascens; both species are native to the area, but they mingle with other introduced ones, such as for instance Camassia – a plant typical of the North American prairies, also used by the Native populations. Rising again towards the top of the garden, around the house is a beautifully prolific specimen of Rosa banksiae, which provides an incredible display when it is in blossom in the middle of spring. These climbing roses are very common in the English gardening style, but a much rarer sight in Italian gardens, and people who come to the Casoncello often travel far and wide to see it in blossom, trying hard to time their visit at the right moment (flowering times obviously vary slightly from year to year). 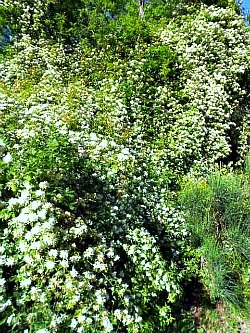 There is also a similar sight in the lower part of the gardens – especially by the 'meadow of the 0ak-rose', where a specimen of R. banksiae climbs on a tree trunk. Above the big quarry by which the conglomerates that represent the base of the Inferior Pliocene come to the surface (Monterumici Formation) one can find the so-called Scascoli Gorges – a section of valley deeply cut in the rocky outcrops, at times quite spectacular, and in which one can observe the marls and the calcarenites of the Pantano Formation. 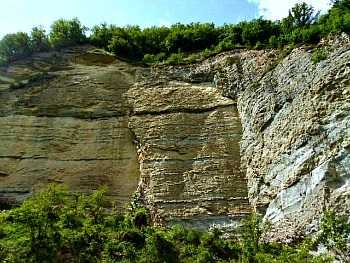 Along the gorge, there is an alternation of levels with different degrees of cementation and granulometry that is further evidenced by selective erosion, which makes particularly evident the thin network of faults that cross the rocks (see image below). Corresponding to these faults and small fractures, the layers are displaced for several meters, and if one tries to follow the sequential progress of a single layer both sides of the fault it is not difficult to identify the dislocation that it was subjected to.